Green Bay Packers – Official Blog | Pregame warmup: Who’s going to return kickoffs for Packers? Pregame warmup: Who’s going to return kickoffs for Packers? GREEN BAY –The Packers will have a new kickoff returner on Sunday. Who will it be? Green Bay has deactivated RB DuJuan Harris, the primary kickoff returner this season. On the team’s unofficial depth chart, S Micah Hyde and rookie WR Jeff Janis are also listed as kickoff returners. Janis is also inactive, which leaves Hyde as an option. Another option could be WR Randall Cobb, who has performed that duty in the past and was named one of two special-teams captains two weeks ago. Not that cold: Earlier in the week, the forecast for Sunday’s Packers-Lions NFC North showdown was for some pretty chilly temperatures, but now those are not going to arrive until a few days from now. For the 3:25 p.m. CT kickoff, temperatures are expected to be in the mid to high 20s, with minimal wind and no chance of rain or snow. The temp isn’t supposed to drop below 20 until well after the game will be over. It’s still a switch from the 70-plus degree weather the Packers played in last week in Tampa, while the Lions are outdoors in the Midwest for the second week in a row after a victory in Chicago last Sunday. In any event, it doesn’t appear the weather will play much of a factor in this game, if any. The playoff picture: It’s pretty simple — the winner of this game wins the NFC North, earns a playoff bye and finishes no worse than the No. 2 seed in the NFC. For the Packers to get the No. 1 seed, they’ll have to win and have the Seahawks lose to the Rams. The Lions haven’t won in Wisconsin since 1991 and haven’t won the division since 1993, two streaks they’re determined to end today. Detroit is in the playoffs regardless for the first time since 2011, while the Packers are in the postseason for the sixth straight year. Franchise record could fall: Packers WR Jordy Nelson has 1,433 receiving yards this season and needs 65 yards today to break Robert Brooks’ single-season franchise record of 1,497, set in 1995. If Nelson can get 67 yards receiving, he’ll become the first player in team history with a 1,500-yard receiving season. Nelson has 92 receptions, and if he can catch eight passes today, he’ll also become the first Packers WR with 100 receptions in a season since Brooks in ’95. History lesson: Twelve years ago, the Packers entered Week 17 with a chance to win and earn the No. 1 seed in the NFC. Two years ago, a first-round bye was at stake in Week 17. Both of those games didn’t go well, but they were on the road. 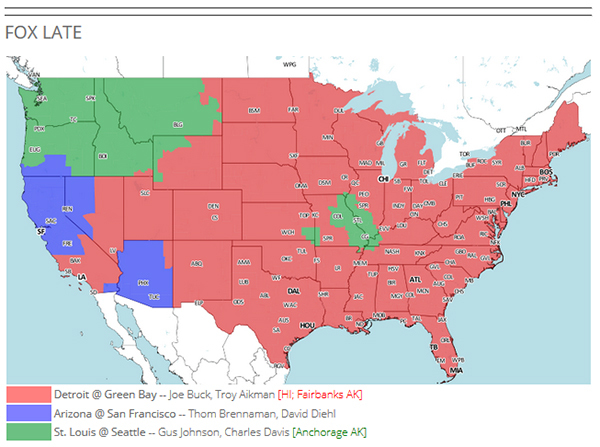 TV map: Here’s the FOX TV map for the late-afternoon time slot.